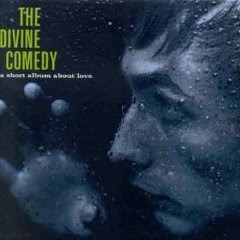 I have a problem with The Divine Comedy, the problem is that they remind me so much of musicians that I love such as Scott Walker and David Ackles they I like them by association more than because of the music itself. This short album is another example of this. The David Ackles influence is more to the forefront here, and it is a pretty good album, but it has been done and in a better way before. So I find the album very enjoyable but really if I want to listen to it I might put something else on. This is actually quite sad because I'd really like to love it. But hey, I just like it. The middle eight of "In Pursuit Of Happiness" was subsequently adopted as the theme for the TV series Tomorrow's World . The original version was used for one season of the show, with a specially-recorded version being substituted thereafter.